Need new apps for your favorite device? Here are 72 iPhone, iPad and iPod touch apps that just hit the App Store. 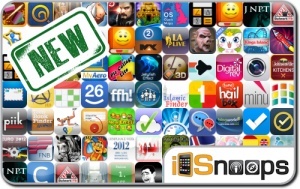 This new apps alert includes Joan Jade: The Gates of Xibalba, Cosmic Kingdoms, Sheep Up!, Jenna Jasmine: Psychic Detective, ExQuizit, Cake Slayer, FireworX Stand, Kings Island, Pinger, Quick Five Dial, Cloudee, Time Ruler, and many others.